Yesterday, a friend of mine, Luis Suarez, posted some information on Google+ about sleep, which elicited a fair amount of commentary (including from me) and, in the process, reminded me of a story that comes from my first days as a member of the Flight Operations team on the Space Shuttle Main Engine (SSME) program. I’ve written before about my feelings regarding meetings and their efficacy, which I tend to frequently question. However, this was a meeting where I might have been able to learn more about the job I was embarking upon. Unfortunately, it didn’t quite work out like I hoped it would. The aerospace industry, like many others, is replete with acronyms. In addition, I was working at an organization that was primarily an Engineering company and I’m not an Engineer. After over two decades there I have often noted I am now covered with a reasonably thick patina of Engineer, but this was at the very beginning of my tenure and everything was new to me. This particular meeting was a telecon with our NASA counterparts at a time when the U.S. Space program was recovering from the destruction of Challenger. The year was 1988 and we were approximately 8 months away from returning to flight; human flight, that is. Although the SSME was in no way implicated in the disaster, we had been using the stand-down to prepare a Failure Mode and Effect Analysis, as well as a Critical Items List (referred to as a FMEA-CIL). It consisted of breaking down the operation of our engines into discrete activities beginning with “tanking” (the loading of fuel into the External Tank) and ending with MECO (Main Engine Cut-Off). To make a long story short, I entered a packed conference room designed to accommodate approximately 35 – 40 people. It was full, with every available seat taken, and there was a conference phone, on the other side of which was an equally packed room at Marshall Space Flight Center in Huntsville, AL. I don’t recall the specific technical issues that were discussed at that meeting, partly because I really didn’t have the faintest idea what they were talking about – especially because of the prolific use of the aforementioned acronyms and technical jargon, as well as the use of numerous bullet charts and a dizzying array of graphics which, presumably, represented performance data of various sorts. I sat in the back, against the wall, and tried to follow along, anxious to learn what I could about my new job and what my organization was responsible for. It wasn’t long before I felt my head bang against the wall. With horror, and not a little consternation, I realized I had dozed off. To make things worse, I was quite certain I had begun to snore, as I have been shunned by many because of my snoring. I also noticed I received a couple of sidelong glances from my new colleagues. Needless to say, I got up and left the room, delaying my education . . . and hoping I hadn’t been noticed by too many influential people. I never forgot that day and, throughout my over two decades career there, I was always conscious of the possibility of falling asleep during meetings, especially terminally long ones where incredibly arcane technical discussions were accompanied by the kinds of charts I grew used to, and which Edward Tufte so vociferously decried. In that more than twenty years I also witnessed an awful lot of people dozing during meetings, especially if they took place after lunch – in the Hypoglycemia zone. 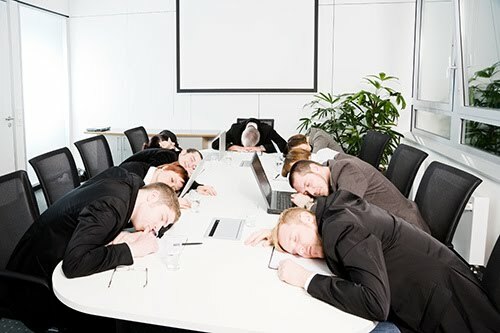 I really think meetings are over-rated and we tend to have far too many that are unproductive and unnecessary. Is this the case where you work? This entry was posted on Sunday, November 27th, 2011 at 2:28 pm	and tagged with Hypoglycemia, meetings, NASA, Sleep, SSME and posted in Business, Science. You can follow any responses to this entry through the RSS 2.0 feed.